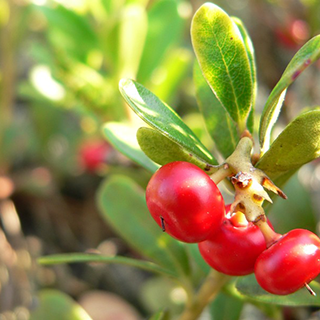 Native to moorland in Europe, Asia, and North America, this plant's fruits are a favourite food for bears - hence its common name, bearberry or uva-ursi (in Latin literally, "grape-bear"). It is highly regarded by herbalists as a urinary antiseptic largely due to the presence of chemicals called hydroquinones, which help to disinfect the urinary tract. Drink 1 cup (1–2 tsp herb per cup of boiling water) of leaves 3 times daily for cystitis, urethritis, or burning pain when urinating. It is often combined with couch grass or cleavers. For any severe or persistent urinary symptoms, you should seek urgent medical advice to avoid any potential damage to the kidneys. Take 40–80 drops (2–4ml) 3 times daily for urinary problems or leucorrhea (a white or yellow vaginal discharge). Available commercially, often in combination with dandelion, as a remedy for fluid retention. Follow the directions on the package. A moorland plant, it prefers moist, fertile, acidic soil in partial or dappled shade, and makes good ground cover in the right conditions. Requires lime-free (ericaceous) soil. Sow seeds in a cold frame in autumn and pot as soon as the seedlings are large enough to handle. The leaves are mainly collected in spring or summer, and the berries are collected in autumn.